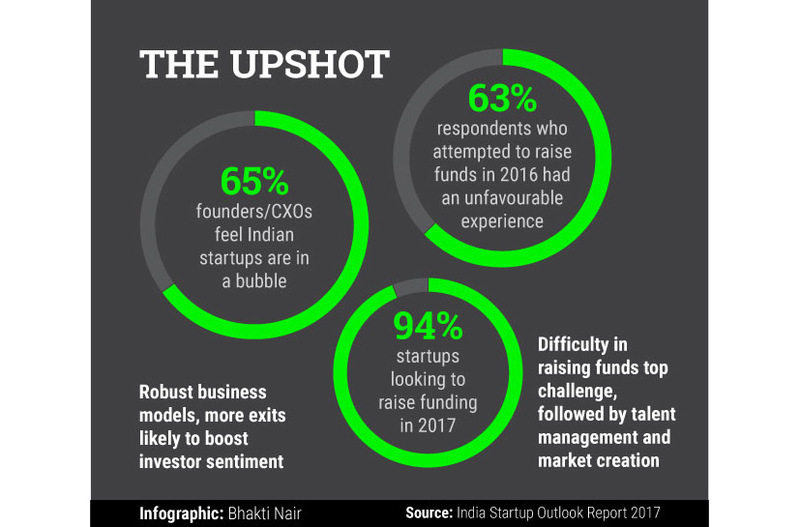 Almost 65% founders and CXOs at Indian startups feel the ecosystem is in a bubble, and close to one in five among those (18%) feel the bubble is close to bursting, says India Startup Outlook Report 2017 released by venture debt firm InnoVen Capital. 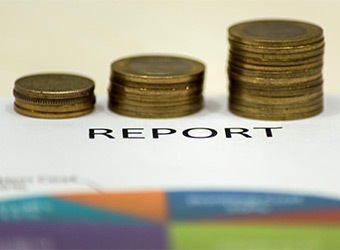 The report, which draws on startup leaders' perspectives on matters such as fund-raising, investor sentiment and business challenges, captures responses from the top layer at 170 funded and bootstrapped ventures. On fundraising, as many as 63% respondents who attempted to raise funds in 2016 confirmed they had an unfavourable experience, with almost half of these not being able to raise any money. The rest raised funds through either a sub-optimal external or bridge round. Most respondents believe that factors likely to boost investor sentiment in 2017 are more companies with robust business models, followed by a higher number of exits. The least likely factor is Indian unicorns raising more money at higher valuations. The report also shows that close to 94% startups are looking to raise funding in 2017, with VC-backed firms aiming to raise a median amount of $12.5 million. The average expectation on how long it would take to close a round stands at 4-5 months. Although difficulty in raising equity funding was voted as the top business challenge, followed by difficulty in managing talent and market creation, it is unclear whether fundraising will be more challenging in 2017 as respondents were divided on this. Overall, almost three-fourths of the set surveyed believed the startup ecosystem in 2017 will be driven by entrepreneurs, while 26% voted that investors will play the pivotal role. The survey also concluded that the most critical factor in choosing a lead investor was strategic fit with the startup, followed by investor network and commercial terms of the deal. For VC-backed companies, however, the strength of the institution brand was most important. Most startup leaders said their focus in 2017 will be growth. However, VC-backed companies opted for profitability as the primary problem to solve. Only 38% of the cash-burning companies had a higher burn rate in 2016 compared to 2015 and, overall, the median timeline for achieving profitability is expected to be 1-2 years. Separately, the preferred mode of exit for majority startups is to publicly list either in India or offshore, with 30% selecting M&A as the top choice and another 30% opting to continue to remain private. In all, 64% of the respondents expect an exit event in the next six years. Workforce hiring and representation was another aspect covered in the report. Of the companies observed, 24% had women representation on the board, 18% had women in CXO positions, and 33% were actively looking to hire women in senior roles. Sales, technology and marketing were areas in which hiring top executives has been, or is expected to be, the toughest. More than a quarter of respondents would prefer to relocate to another city, with Bangalore being the top choice. The majority of respondents, especially business leaders in the retail consumer and logistics sectors, chose GST as the most helpful recent government initiative. Media and content sector found the push towards Digital India a shot in the arm and fin-tech companies were appreciative of digital payment tools such as UPI. Interestingly, demonetisation was seen as favourable in the short term by only 22% respondents, a number that rose to 52% in the long term. The entrepreneurs converged on the following three major measures that can make India more appealing for startups: better tax policy, facilitation of cheaper financing and investment in digital infrastructure.